Tungsten carbide grit with coarse grit on one side for rapid cutting and shaping and fine grit of the other for finishing. Sands perfect 90 degrees when placed on its side. Tungsten Carbide Grit, one of the hardest known materials next to diamond, braze welded to steel. 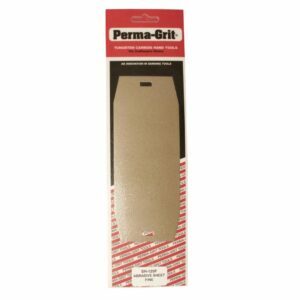 COARSE (C) grit for rapid cutting and shaping. CLEANING To remove glue, paint, resin, etc use paint remover.